BRUSSELS (Sputnik) - The European Commission has filed official complaints against Hungary at the Court of Justice that could result in heavy fines, while Open Society Foundations, founded by Hungarian-born business magnate George Soros, is also taking Budapest to court over the law on aid to migrants. The problem has been festering since 2015 when the European Commission decided that all European countries had to accept a certain number of refugees depending on the size of their population. Poland, the Czech Republic, Slovakia, and Hungary refused, arguing that it was a breach of their national sovereignty. The European Commission filed official complaints at the European Court of Justice, so Hungary might end up paying fines amounting to tens of millions of euros. The European Commission triggered Article 7 of the European treaty, which, if applied, could lead to the suspension of some of the country's membership rights. The process culminated on September 13th, 2018, with a vote on the Sargentini report on Hungary, written by left-wing member of the European Parliament Judith Sargentini (Dutch Green party), and accusing Hungary of refusal to accept migrants, but also of meddling with its justice system and introducing laws against the freedom of education. Poland is also facing disciplinary proceedings, launched by the European Commission in December last year. The case has yet to reach the European Parliament. A number of countries in Central and Eastern Europe are relying greatly on the European Regional Development Fund (ERDF) and the Cohesion Fund. The renovation of local infrastructure, from the Wroclaw railway station in Poland to Planica Nordic Center ski complex in Slovenia, has been helped by these funds. "The European Union hits Hungary and the other Eastern European member states to the wallet! After the threat of political death by the loss of the voting rights inflicted on Hungary with the Sargentini Report, the European Commission is aiming for financial retaliation: with the new version being concocted of the Regional Development Fund, Poland would see its allocation of ‘cohesion policy’ melt by 23 percent and Hungary by 24 percent," Dominique Bilde, French member of the European Parliament (RN) in the EDF group, told Sputnik. The proposals for regulations on the ERDF and the Cohesion Fund (Article 2.1) and on the European Social Fund (Articles 4.1 and 7.3) cover specific objectives in this area. For the latter, which already devotes a significant part of its missions to "vulnerable groups," a minimum percentage of 25 percent of shared management resources allocated to the "social inclusion" component, which concerns migrants, in particular, is set. There seems to be a similar reference in the European Semester, a monitoring mechanism through which the European Union regularly challenges states on an ever-wider range of policies. In its recommendations to France of 23 May 2018, it seemed to advocate, in carefully chosen words, the use of positive discrimination in employment for populations "from immigration." The Open Society Foundations is taking Budapest to court over the adoption in June by the Hungarian parliament of a set of laws dubbed "Stop Soros." The laws impose a 25 percent income tax on charities helping undocumented migrants and punishing those who help migrants enter Hungary illegally. Under the new Hungarian reforms on non-governmental organizations, organizations receiving over 24,000 euros (about $28,259) of foreign financing have to register as "civic organizations funded from abroad." Meanwhile, the new education law changes the requirements for foreign universities stating that they should offer courses not only in Hungary but also in the country where they are registered. This requirement has been seen as targeting the Central European University founded by Soros. The European Commission found that the act runs counter to the right to academic freedom. The Open Society Foundation announced in August that its regional headquarters would be moved from Budapest to Berlin, denouncing the measures introduced by Budapest. 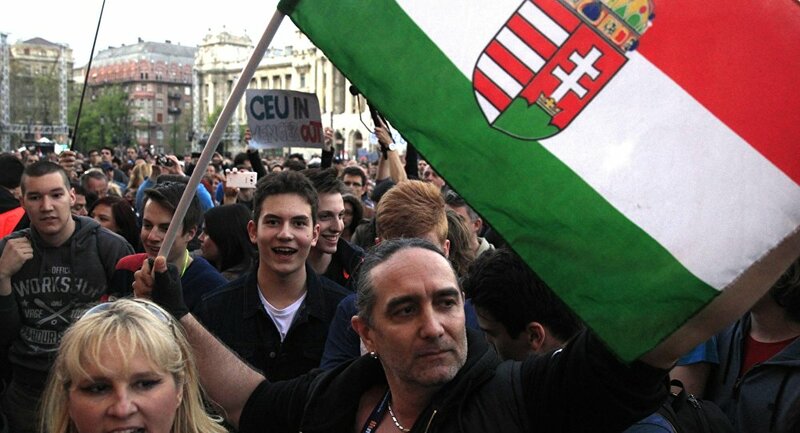 Can Europe Undermine Hungarian Leadership? The application of Article 7 of the Treaty needs unanimity in the European Council, and several countries, Italy, Slovakia and Poland, have already announced that they would oppose the sanctions against Hungary. In addition, a European spokesperson told Sputnik it was "not clear what other rights can be suspended." Mischael Modrikamen, the president of the Belgian Parti Populaire (PP), stressed that Hungarian Prime Minister Viktor Orban was not alone in Europe. "He is a democrat, elected by 52 percent of the citizens of his country, and he was supported in the European Parliament by all the ‘populist’ parties but also for example by the British Conservatives, who voted against sanctions for Orban, and by several MEPs from the French center-right party The Republicans and others in the [European People's Party] EPP group. The European Union is not a democracy anymore and the role of George Soros at the European Commission level should be investigated," Modrikamen told Sputnik. When Orban addressed the European Parliament on September 12 in defense of his government, he labeled the threat of censure as "blackmail" and an insult to Hungary. He claimed that the report by Dutch Greens MEP Judith Sargentini was an "abuse of power" and included "serious factual misrepresentations." Hungarian Minister of Foreign Affairs Peter Szijjarto said on the same day that Sargentini never even went to Hungary. The opposition to Orban received a boost when Manfred Weber, leader of the European Parliament's center-right EPP group, voted to trigger Article 7. However, several members of the group gave their backing to Budapest, thus creating an internal split. The Central European countries could be slapped with heavy fines by the European Court of Justice, but it could be reversed after the next European elections in May 2019, in less than nine months now. The views expressed in this article are those of the speakers, and do not necessarily reflect those of Sputnik.